Sterling silver 1/4" wide shank with chinese turquoise, spiny oyster, mother or pearl and jet inlay. 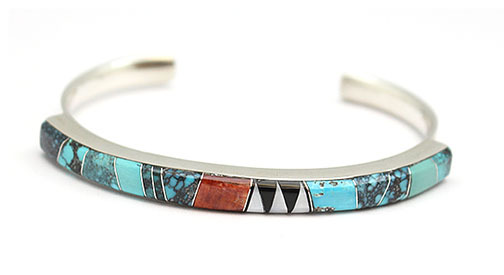 It is Navajo made and inlaid by Laura Lincoln. Inlay patterns and color placements will vary. One is mostly turquoise with one section of spiny oyster. Choose color combo when ordering.